On Saturday I went shopping. Bukit Bintang is basically the mecca of KL shopping. It is in an area sometimes known as The Golden Triangle. 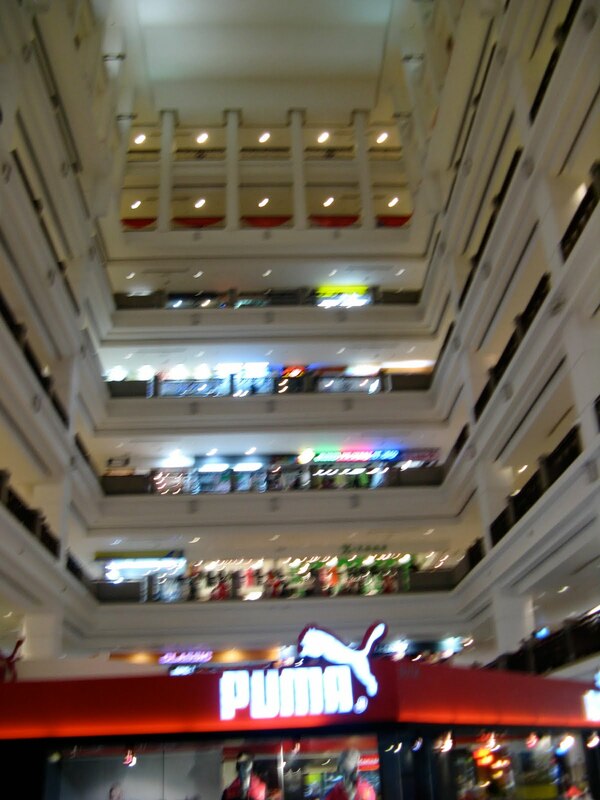 There are four major malls here- Sungei Wang and Times Square, for bargain hunters of all sorts, especially clothes, shoes, bags and electronics. Then there is Pavillion, an upscale mall that reminded me of the ones that sprout all over Hong Kong. It's beautiful, and the food court there (The Food Republic) boasts basically every kind of Asia cuisine, from curry to kimchi. Last is Lot 10, but as I didn't get there, it won't figure into this post. To get to Bukit Bintang we had to take a harrowing ride on the monorail. The cab of the monorail is short and squat, and not nearly big enough to admit the crush of people trying to get on from KL Central station. As a result, I ended up shoved into a metal bench, bending over a woman sitting down, with my shopping bag sticking in her face. It got worse with every station, and still when people were packed like sardines and almost blocking a door, a middle-aged Chinese woman with a scowl on her face attempted to push into the train, further bruising my already smarting hip bone. She uttered angry words, but gave up when she could not push herself onto the train. Mercifully, the train ride was short. And suddenly, we were the ground-floor atrium of Times Square that slightly resembles the open concept of the CBC building in Toronto. I looked up and up and up at floors of shops that seemed never-ending. Where to start? The food court of course, where one can buy a promotional meal for only 4.90 ($1.60 in USD/CDN). Then it was on to the shops. We only covered 2 or three floors, but it was enough to leave dents in our pocket books. Only slightly though. Rarely was any item of clothes over 30 Ringgits, and most hovered around 25. I bought a belt for 9 RN and bright coloured nail polish for under $2 from the lovely Elianto. I was also able to nab an FC Barcelona keychain for my brother, the football-crazy fan. After we were shopped out there, we headed to Sungei Wang to find someplace to rest our tired feet...and satisfy our sugar craving. What we discovered was even more fun- a concept restaurant based on the most colourful, cute bathroom you could imagine. Yes, I said bathroom, as we sat on squeaky-clean toilets and ate off of a glass-covered sink. My ice cream came in a little pottery bathtub. It was sweet enough to hurt my teeth, but I enjoyed it anyhow. You can check out more about T-Bowl here. Sungei Wang seemed a bit classier that Times Square- it was less market and more boutiques and chains. Right away I nabbed a black cardi with intricate lace detail for 29 Ringgits. I also bought a dress for 29 in a store full of the prettiest little numbers you have ever seen. I couldn't make up my mind between two I liked, and unfortunately chose one that ended up not fitting. Many stores in Sungei Wang and Times Square do not allow you to try things on because they sell them so cheap. This store didn't give receipts either, so there is no chance of returning it. Luckily I have a wonderful fellow J-Schooler whose style is similar to mine and who I believe will fit the dress perfectly. It's all part of the KL shopping adventure. Our last stop led us through the crowded streets of night-time Bukit Bintang. There were throngs of people: locals throwing up spinning lights that were liable to land on you if you didn't dodge them, cars honking, performers in sparkling paint frozen in the centre of a ring of people (unless you wanted to pay to take a picture with them), lovely smells wafting from nearby restaurants, and tourist girls wearing a camera and not much else (their dresses barely counted as dresses). Pavilion is as luxurious as you could hope. My eyes were dazzled by the huge red and pink decorations in place for Chinese New Year, and the upscale stores for young and old (Marc by Marc Jacobs and Burberry were just some of the offerings). Fat statues celebrated the Year of the Rabbit and huge flowers took up some of the expansive floor. Wide red steps leading down into the mall were covered with tourists taking pictures. By the time we reached Pavilion, we had only time to eat a well-deserved dinner. I ordered the biggest bowl of noodles I have ever seen from a Thai fast food counter. (Picture soon) As we sat and ate I watched people pass with bags from Cotton On and Forever 21, two of my favourite stores. Alas, the mall was closing as we struggled to finish our meals. I think my wallet breathed a sigh of relief though. It was a long ride back as we trudged on aching legs and tried to ignore the rowdy pre-teen boys that were harassing the monorail passengers. But it was a happy kind of tired, the kind a little souvenir retail therapy brings. All in all, I'd say it was one of my most memorable, successful shopping trips. Now that is what I call shopping by the sounds of this post!! Sounds like sooo much fun- it would be so lovely exploring new stores and malls. That food sounds delicious too- the noodles would be devine I imagine!